Opus Energy has officially opened its new headquarters, based in The Lakes Business Park, Northamptonshire, bringing 700 staff under one roof. The new headquarters is known as Opus Energy House, a refurbished state of the art building which will unify the brand’s four offices in the county. Complemented by its sites in Cardiff and Oxford, the office houses numerous key business roles, including customer services, operations, IT, HR, sales, renewables and business change. Nikki Flanders, chief operations officer at Opus Energy, said: “Today marks a key milestone for Opus Energy and I am delighted to officially open our new headquarters. “The new office is the largest investment in our people to date, built to create an energising environment for our teams. Andrea Leadsom, MP for South Northamptonshire commented: “Opus Energy is one of the region’s leading employers and I am delighted to see investment in local jobs and infrastructure. “Northampton is the home of small business with the highest concentration of small businesses in the East Midlands. The refurbishment has seen some innovative additions, including a well-being room and studio to prioritise employee wellness. Other benefits include a subsidised restaurant, courtyards and a rooftop terrace, as well as plentiful parking, green surroundings, good connections with public transport and a location close to the city centre. Nikki Flanders concluded: “We embrace our role as an award-winning supplier in the business energy sector and have clear targets to ensure we continue to not only expand but also to continue to support and energise businesses across the country. Opus Energy is the UK’s sixth biggest business energy supplier, ranking in The Sunday Times Top Track 250 for the last six years, most recently in 6th position. It employs over 900 people between Northampton, Oxford and Cardiff, and was named one of the Top 100 Best Companies to Work For in 2015 by The Sunday Times. Opus Energy supplies more than 315,000 business locations across the UK with electricity and gas. The National Grid has issued a “gas deficit warning” over fears supplies could run out as temperatures plummet across the country. The operator of the UK’s power network issued the guidance at 5am on Thursday as supply slipped 48 million cubic metres short of demand. A spokesperson said the notice was a “first stage” warning to say “it’s looking tight”, which will remain in place until 5am on Friday. What happens if we actually run out of gas? “National gas demand today is high and due to the extreme weather conditions, there have been gas supply losses overnight,” the operator said in a statement. “At 5.45am this morning we issued a ‘Gas Deficit Warning’ to the market. The energy regulator has put forward plans for its toughest ever clampdown on energy network profits in a bid to save households £5bn over five years. In a second major blow to the energy industry ahead of its proposed retail price cap, Ofgem has laid out plans to cut the amount of revenue energy companies such as UK Power Networks, SSE Electricity Networks and Scottish Power’s SP Energy Networks can return to shareholders. Amid mounting political scrutiny of the sector, focus has turned to the part network costs play in adding to household energy bills. The operators of Britain’s electricity and gas grids claim around £250 a year from an average annual energy bill of £1,100 to maintain the pipes and wires that deliver energy to 30 million homes. But under Ofgem’s new plans customers should be able to save between £15 – £25 a year, in what amounts to the regulator’s biggest ever cut to companies’ allowed revenue. Ofgem will tighten the screw on network profits by slashing the cost of equity, which is paid to shareholders, from a baseline of between 6-7pc under its current regime to between 3-5pc from 2021. The lower end of the range goes much further than the recommendation of a independent study commissioned by industry body the Energy Networks Association, which called for returns of around 6pc. Ofgem has argued that energy networks should follow the lead of water companies, which have faced a tighter squeeze on their allowed revenues. But the ENA maintains that energy networks face greater technology challenges, which mean their investors require higher returns. New technologies, such as renewable power and smart grids, mean more investment is needed to upgrade the grid. However critics of the network companies believe they are making unfair profits at the expense of customers under Ofgem’s watch. Official figures show that even with a baseline rate of return of around 6pc network companies have been able to make returns as high as 12pc by clinching rewards for beating their regulatory targets. Ofgem has also suggested shortening the regulatory control period from eight years to five. Jonathan Brearly, Ofgem’s networks boss, said the shorter price control would help regulation keep pace with the rapid changes in the energy system. “The energy sector is rapidly changing and consumers must be confident they continue to get good value for money for the services the networks deliver,” Mr Brearley said. Electricity network companies’ exceptionally high profits are set to add £20 to household energy bills this year, despite regulator Ofgem introducing a new regulatory regime designed to control profit margins, a report finds. The analysis, from the Energy and Climate Intelligence Unit (ECIU), finds that in the first year of the price control mechanism known as RIIO, the six distribution network operators (DNOs), the firms that operate regional power networks, posted an average profit margin of 30.4%, with average dividends at 13.3%. If DNOs continue at the same level of profit margins this year, that will make the average annual household electricity bill about £20 higher than if their profits were at a similar level to those of the ‘Big Six’ energy firms. Network costs now make up more than a quarter of the average domestic electricity bill, a share that is set to rise in coming years. Commenting, Richard Black, director of the ECIU, said that the findings should open up the debate around energy bills. “Ministers, the press and the public are rightly worried about energy bills, and the news that these monopoly operators are making profits beyond most companies’ wildest dreams will only add to these concerns,” he said. An ECIU report last year found that DNOs made annual average profit margins of 32% over the previous six years, equating to about £10bn on the nation’s collective energy bill over six years (2010-15), or around £27 per home per year. The DNOs argued that the introduction of RIIO would change this picture: ECIU’s new report suggests that, from the evidence available, RIIO has made no impact on profits or dividends. These findings add further weight to calls from Citizens Advice for network companies to return excess profits to customers. The 2017 report Missing Billionsshowed that consumers are set to overpay by £7.5 billion during the current RIIO period. “Ofgem has admitted it was asleep at the wheel on energy price caps. Now it has a chance to do better by using its powers to take on the monopoly Distribution Network Operators (DNOs) which own the power lines that get energy to our homes. “The DNOs are low risk, monopoly businesses. But they have even fatter profit margins than the Big 6 energy firms, all paid out of the pockets of hard-working energy customers. “DNOs have a vital role in the transition to the energy systems of the future, connecting and managing the distributed, democratised, low-carbon network to ensure that consumers can benefit from the plummeting costs of renewables. However, whilst many of the firms deserve credit for their work in promoting the transition to smart power networks, Ofgem’s failure to corral companies in the right direction – with these high profit margins appearing instead – places the shift to a modern, flexible grid at risk,” she said. The report, RIIO Carnival: How new Ofgem regulations are failing to hit high network company profits, is available here. The Government’s crackdown on rising energy bills could be gamed by suppliers offering pricier ‘green’ tariffs via a legislative loophole, the industry regulator has warned. Ofgem warned MPs that its plan to cap standard energy tariffs could be undone if energy companies are able to claim their tariffs carry green credentials in order to charge more for their electricity and gas. Ministers are preparing to legislate a market-wide cap on all default tariffs in a bid to end “rip-off” energy deals, but low-carbon offerings will not face the same clampdown because costs for green energy are higher. The potential escape clause has emerged almost a year before the controversial price cap, which many fear could bring a raft of other unintended consequences including lower consumer engagement with the market and reduced competition. Dermot Nolan, Ofgem’s chief executive, told a parliamentary select committee on Wednesday that customers switching between tariffs could fall under a price cap but said that the switching rate alone would not determine whether the market is working for consumers. He later admitted that the regulator has not sought the opinion of consumers on the price cap plans but would agree to undertake a survey before it is implemented. In the meantime, Mr Nolan called for tougher wording in the bill to make clear that companies cannot dodge the cap by making spurious green claims about the energy it supplies. He added that Ofgem was prepared to issue pre-emptive warnings to companies which may be tempted to exploit the loophole. Mr Dermot, who has led the regulator for four years, faced a barrage of questions from the committee over his tenure at the helm and denied that he has acted as a passive bystander to the growing concerns over energy bills. He added that he had not been awarded a bonus for 2017 and apologised for not acting sooner to bring in the new energy cap for vulnerable customers. He also promised that any supplier found to be wrongfully using the green-tariff exemption to charge customers above the price cap would be forced to withdraw the deal immediately and repay the excess charges on top of a penalty determined by the regulator’s specialist panel of disciplinarians. Energy regulator Ofgem has said that a plan to cap standard variable energy tariffs for millions of British households could be in place by Christmas this year. In October, Prime Minister Theresa May pledged to introduce legislation to end “rip-off” energy prices by putting a price cap on bills. Speaking to a parliamentary select committee on Wednesday, Ofgem chief executive Dermot Nolan said that for a cap on energy bills to come into force by the end of the year it would need to become law before politicians and lords break up for the summer recess in July. Once that law is passed, Ofgem will need to launch a statutory consultation process of around 50 to 60 days, after which energy suppliers will be given a further grace period to implement the necessary measures. The Business, Energy and Industrial Strategy Committee was questioning Mr Nolan as part of its pre-legislative scrutiny of the Government’s draft bill to cap energy prices. Annual energy bills in Britain have reportedly doubled over the last decade, rising by about £1,200 per household. Figures from Ofgem show that 57 per cent of households – or around 13 million – are on standard variable rate tariffs which are typically the most expensive. They are the basic rate that energy suppliers charge if a customer does not opt for a specific fixed-term deal. Mr Nolan said that vulnerable customers had been failed by the system and admitted that Ofgem should have done more to help them earlier. “I accept we should have done better with vulnerable customers,” he said. Committee chairwoman Rachel Reeves accused Mr Nolan of acting “like a bystander rather than an active participant in the market” and challenged him over Ofgem staff bonuses which reportedly totalled £921,000 for the 2015/2016 tax year. “Your role is not to hope that next year fewer people are paying more than they should be on standard variable tariffs, but to stop this exploitation of customers,” she said. Mr Nolan said that bonuses were calculated according to civil service guidelines. Ofgem confirmed to The Independent that Mr Nolan and other members of the executive board did not receive a bonus for the 2016/17 tax year. Ofgem is introducing a safeguard tariff in February that will help protect around a million vulnerable customers from overpaying on their energy bills. The regulator has said that it plans to extend the scheme to two million more households next winter. Data also published by Ofgem in December showed that among Britain’s “Big Six” energy suppliers, SSE had the largest percentage of customers on SVTs at 71 per cent. British Gas, owned by Centrica, had 67 per cent of its customers on SVTs and E.ON had 61 per cent. The country’s other three main suppliers are EDF Energy, Innogy’s Npower and Iberdrola’s Scottish Power. Theresa May is facing a backlash from senior Conservatives over her plans for a price cap on energy bills. Almost 20 Tory MPs, including three former cabinet ministers, have warned that her proposals for an “absolute” cap on bills will reduce competition between firms and “distort” the energy market. In a formal submission on the Government’s draft Energy Price Cap Bill, the backbenchers, including Oliver Letwin, David Cameron’s former policy chief, and Caroline Spelman, the former environment secretary, say that the measure will lead to prices simply being raised to meet the new limit. Instead, the MPs call on Mrs May to introduce a “relative” cap, which has found more favour with MPs ideologically opposed to interventions in free markets. Unlike an absolute cap, which would set an overall maximum price, a relative cap would set a maximum mark-up between each energy firm’s best deal and the standard variable tariff paid by most customers. John Penrose, a former constitution minister, who had campaigned for a price cap, said that a “relative” limit was a “Conservative answer” to the problem of “rip-off prices” – while an absolute cap “would cut customer choice and competition”. The announcement of a new bill introducing an energy price cap was one of the centrepieces of Mrs May’s speech to the Conservative Party’s conference in October and was seen as a key element of plans to win back disaffected voters. The intervention by Mrs May’s MPs, who were joined by senior figures from Labour and the Scottish National Party, will put pressure on the Government to overhaul the current proposals before a final version of the bill is submitted to the Commons in the coming weeks. The disclosure of the submission, to the business and energy committee, comes ahead of an appearance in front of the committee by Margot James, the minister for consumers, on Wednesday, when the criticisms are likely to be raised with her by MPs, who are scrutinising the draft legislation. It was led by Mr Penrose and signed by 19 Tory MPs, in addition to Patricia Gibson, the SNP’s consumer affairs spokesman, Ben Bradshaw the former Labour cabinet minister, and Caroline Lucas, the leader of the Green Party. It was also signed by eight “challenger” energy firms. The document states that a cap is necessary because the market is failing to “work in favour of consumer”. But it adds:”The draft bill proposes an absolute price cap, where regulators meet every six months and pick a number. “It will reduce competition because supplier prices will cluster around a single number rather than pricing off each one’s best competitive deal. Suppliers will sit at the ‘regulatory’ level with little incentive to become more efficient. The MPs add: “It’s a highly distorting approach which replaces daily market-derived prices with infrequent regulator-derived ones, which throttles competition by being far less good at discovering and then meeting consumer needs. “It restores the link between the prices which companies advertise in the marketplace and those which they charge the majority of their customers, incentivising efficiency and restoring competitiveness to the market for ‘back book’ customers,” the submission to the business committee states. “A relative cap may simply prompt the withdrawal of more competitive rates by larger companies while offering no protection to people on poorer value tariffs,” the spokesman said. The first casualty of Britain’s recent gas supply shock has emerged after a small supply start-up said it would need to close due to tough energy market conditions. Businesses are dramatically changing the way they buy energy in Britain and beyond as new technology makes it easier and cheaper to generate their own power. Home furnishings giant Ikea Group now gets almost half of its U.K. electricity from renewables, while Toyota Motor Corp. taps solar energy to build engines in Wales. Australian bank Macquarie Group Ltd. will unveil on Wednesday a service to help businesses cut energy costs and pollute less, competing with existing suppliers including Centrica Plc. More and more British businesses are seeking to save money by using locally sourced power, sidestepping utilities and sparking a global market for decentralized energy that’s expected to expand more than 50 percent to $110 billion by 2021. That shift threatens to cut revenue at the biggest traditional power providers, which typically control everything from generation to distribution. In so-called distributed generation, power plants are connected to a local network, cutting the costs associated with using the main grid. Companies can also reduce expenses through energy efficiency measures, which can save business consumers 3.9 billion pounds ($5.2 billion) a year in the U.K. alone, according to the Policy Exchange research group. Macquarie, which bought the U.K. government’s Green Investment Bank Plc in August, will offer companies financing for new generation and energy saving equipment under supply contracts that may be as long as 15 years and have no up-front costs, said Richard Braakenburg, senior vice president of the energy unit. Traditional energy supply agreements usually last one to three years. In Europe, renewable-energy developers are being forced to find new customers as lower subsidies from governments squeeze their profit. The cheaper green technology has encouraged more companies to invest in their own generation and efficiency programs. In the U.S., a key driver of the trend has been companies like Google and Amazon.com Inc. seeking to demonstrate their shift to cleaner activities, said Bruno Brunetti, head of power strategy at S&P Global Platts. 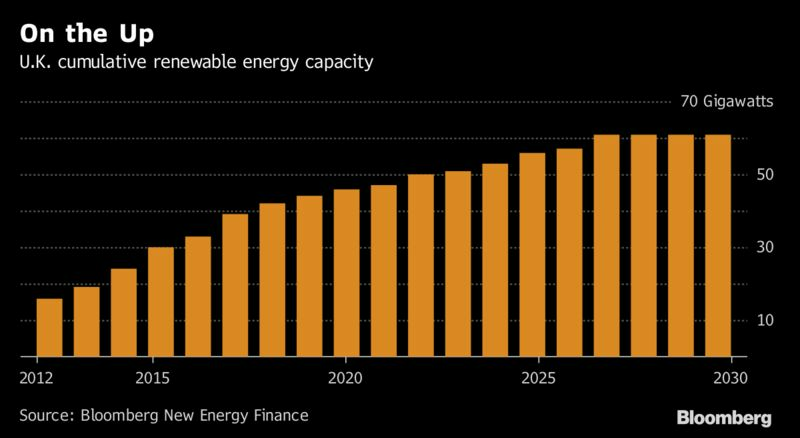 Enel SpA, Europe’s biggest utility by market value, started work earlier this month on a wind farm in Nebraska to power a new Facebook Inc. data center. Globally, the market for distributed generation will expand by 9.5 percent a year through 2021 from about $70 billion in 2016, according to a report byBCC Research LLC, an energy analysis company based in Wellesley, Massachusetts. Ikea plans to be “energy independent” by 2020 and globally plans to spend about 2 billion euros ($2.4 billion) to achieve that target, said Hege Saebjornsen, U.K. and Ireland country sustainability manager. The retailer is already selling energy solutions to its own customers. But all isn’t lost for Britain’s existing utilities, according to Centrica, the biggest household energy supplier. The utility, which issued a profit warning last week, has responded to the changing market with longer-dated contracts to satisfy customers insisting on bigger cost savings than they’ve enjoyed in the past, including help with finance for new equipment and generation. Utility profit margins for decade-long contracts can be closer to 10 percent than the near-zero level on some traditional supply agreements, said Gab Barbaro, managing director of Centrica’s British Gas Business unit. And that’s after the energy supplier and business or government customer share cost savings between them, he said. Don’t just wait for BLACK FRIDAY to save money on your energy bills…..we GUARANTEE to save you money ALL year round. Tell us your energy details and we’ll do a full market comparison to check you’re not overpaying on your current deal. If not, great; if you are, we’ll help you switch. Whether you have moved into new business premises or up for renewal in the next 6 months, simply call us on our free phone number 0344-770-2345 and we’ll get to work on seeing what you could save. Or fill in your details below and we’ll call you.